Fire crews clean up after a vegetation fire on the 7000 block of Highway 1. Zaniboni was on the phone at a small brush fire on a quarter-acre of grass just north of El Capitan State Beach. The call had come in at 11:26 a.m. A full-fledged brush fire response of four engines contained the blaze along the northbound 101. He could not speculate on the cause. Zaniboni was on his way to another fire located on Highway 101 northbound and State Route 1. Fire crews were not yet on scene. A third fire was reported at 12:07 p.m. a few miles further up SR 1, burning four acres on San Julian Ranch. 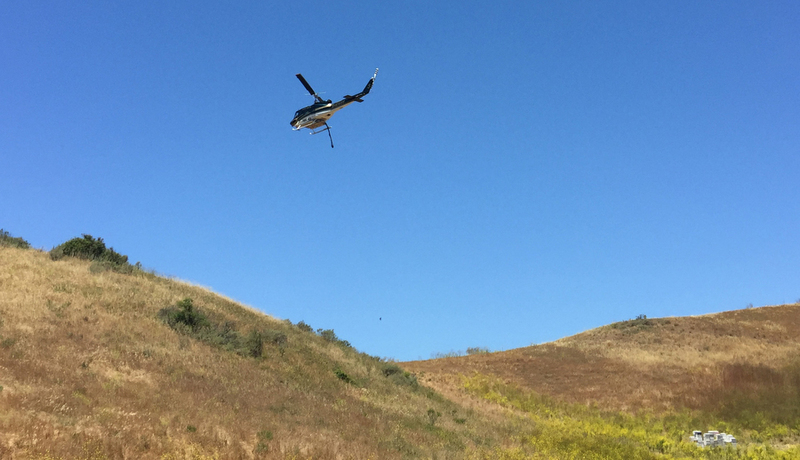 A helicopter responds to Thursday's vegetation fire along Highway 1 outside Lompoc. On Wednesday late morning, just north of the Highway 154 off-ramp in Buellton, roughly five acres were engulfed in flames after a trailed being towed by a truck lost a wheel, which caused sparks. Firefighters contained the fire in about 45 minutes, Zaniboni said, after multiple crews arrived on scene to two acres of burning brush. The freeway was temporary closed Wednesday because smoke was blowing across the road. On Wednesday afternoon, a small fire was reported at the corner of Hollister Avenue and Storke Road, according to Santa Barbara County fire dispatch. The cause is unclear. Zaniboni noted in general the plentiful grass along Highway 101 makes the roadside susceptible to sparks flying from vehicles.